While output remains the goal of an ultra-wide header, there are challenges to overcome when it comes to using such equipment. 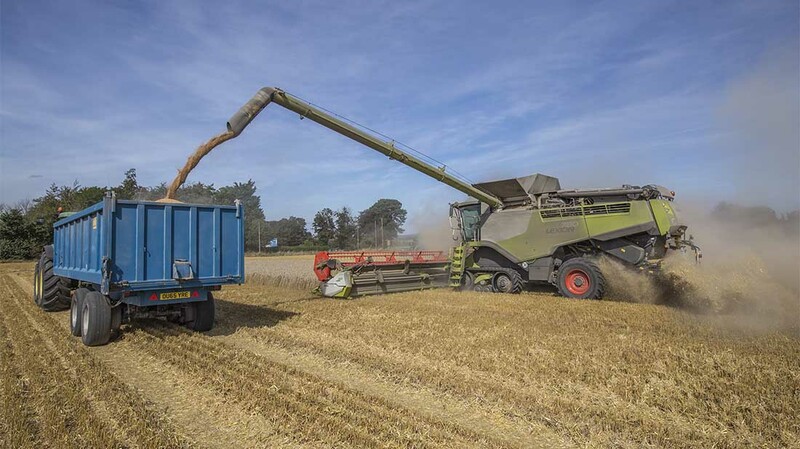 Geoff Ashcroft visits an Oxfordshire grower making the most of a 13.5-metre header. 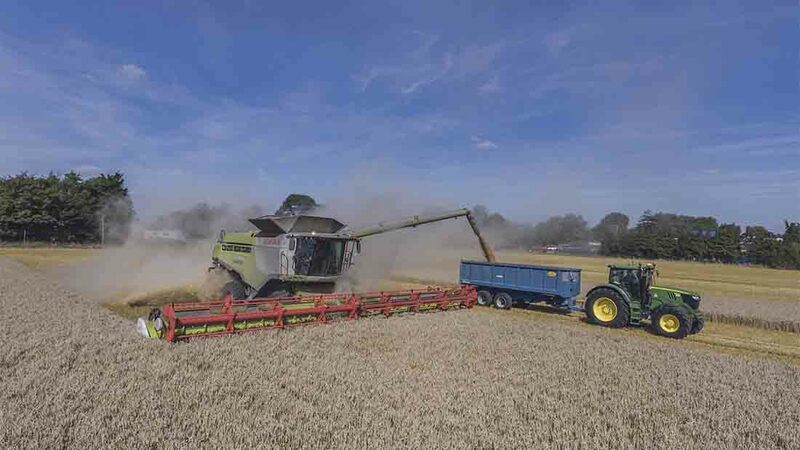 From Manor Road Farm, Wantage, Ben Smith is harvesting almost 2,000 hectares (4,942 acres) of combinable crops with one combine – a Lexion 780TT – equipped with a V1350 header, offering a gluttonous 13.5-metre cutting width. 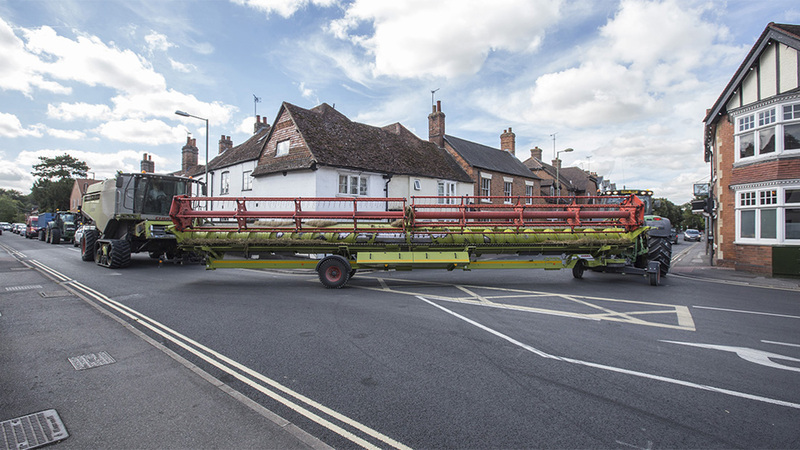 The ultra-wide header replaced a 12m unit, and has helped the transition into a 13.3m controlled traffic farming (CTF) grid, based on 40m tramlines with a 6,000-litre, 40m trailed Chafer sprayer. Ben Smith says: “It was a lightbulb moment as we realised three header widths would fit our 40m tramline system, putting CTF within reach. A Simba Horsch CO12 cultivator drill was sourced, and Manor Road Farm’s workshop guru Tim Sheasby widened the drill, adding new seed distribution heads, additional coulters and seed delivery pipes. Claas’ V1350 is no ordinary header. Built to order, it measures a whopping 13.8m from end to end, which is a tad longer than an articulated lorry trailer. On its own dedicated trailer, the header requires a bit of care and attention when moving from field to field. While its four-tonne weight is modest, the position of the header trailer axles and wheelbase determines overall manoeuvrability. 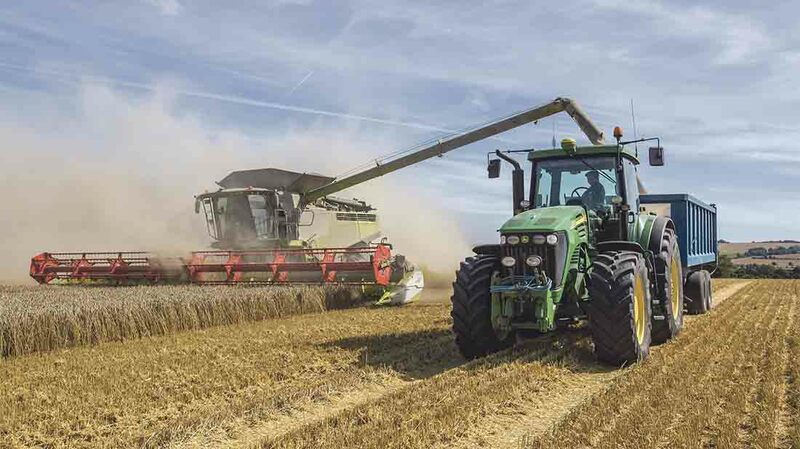 Wide turns and plenty of space are needed, if only to allow enough room for the rear overhang, which is carefully watched by combine operator Steve Rackham following closely behind. With 60 fields ranging in size from 2-135ha (5-333 acres), getting the header on and off the combine has become a slick operation. And when the Smith team moves around local roads, it employs a four-man convoy. 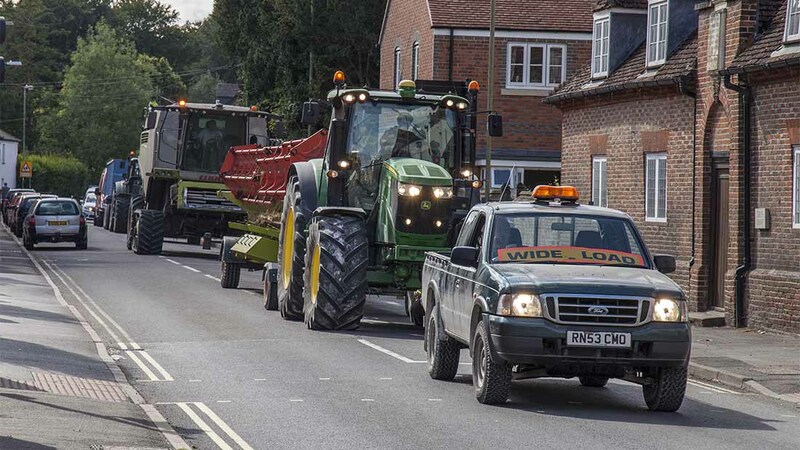 Up front, Tim Sheasby gets his elbows out in the farm pickup, complete with wide load markings, flashing lights and headlights ablaze, to make sure other road users are aware of something slow and large coming their way. The header is moved by tractor, on its purpose-built trailer. Then the combine follows, and a tractor and trailer brings up the rear. All four operators are in constant radio contact – the team watches out for one another and ensures road space is monopolised where necessary, to avoid having to deal with impatient motorists attempting to barge past. 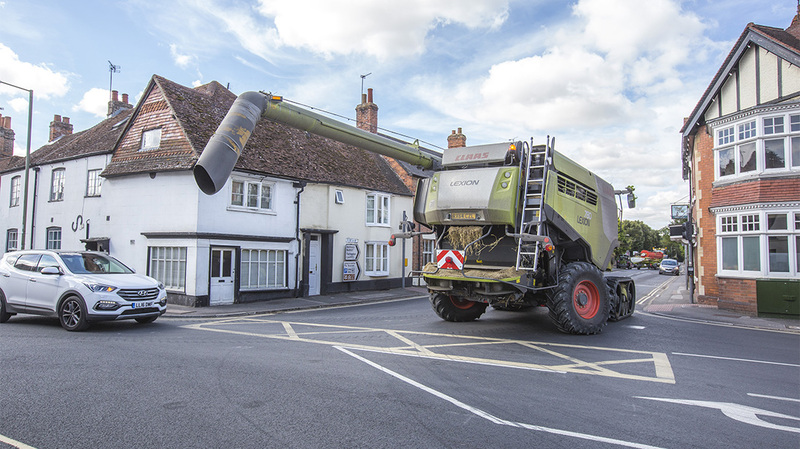 As rear gunner, the tractor and trailer driver keeps a watchful eye on the combine’s rear end and its overhanging auger, as it threads its way around lanes. He is keen to prevent an edgy road-user from ducking in behind the combine, unaware of the auger overhead. 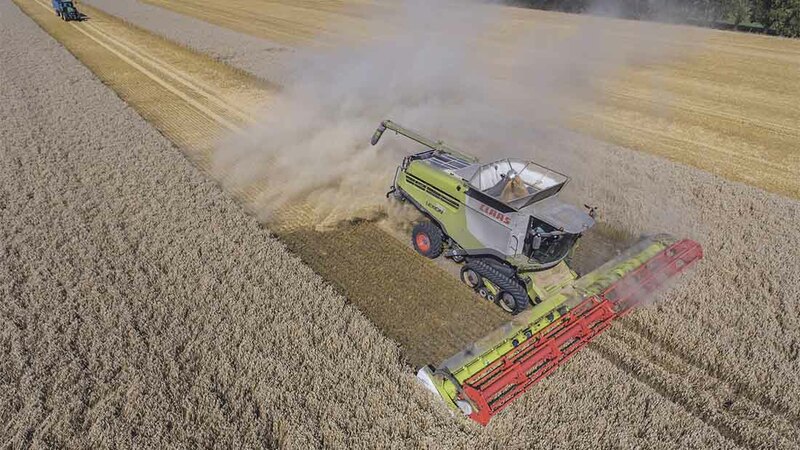 Mr Smith says: “While I would like to go wider, 13.5m is very much the limit of this Lexion’s straw chopping and spreading capability (see below). Not all the farm’s fields are happy to accommodate such a wide header either. With five valleys to negotiate throughout the Vale of White Horse, the team occasionally has to overlook the CTF ideal and make operational adjustments. Operator Steve Rackham says: “There are a few valleys where the middle of the header would pass over the crop while the outer edges would be cutting, and there are some humps where the middle of the header can belly out. With RTK across the farm and auto steering guidance used to full effect, the team is able to keep wheelings under control and make the best use of combine performance. Mr Smith says the increased cutting width – compared to a V1200 header – has not had a detrimental effect on forward speed. He says: “The 780TT takes the wider header in its stride. The increased width gives us much more efficiency, which means fewer runs up and down fields. The Smith team has refined how it unloads on the move, making sure tractors and trailers never leave tramlines, but the size of the auger has also prompted a change in operation. This means an extra 14-tonne trailer is often on-hand to take up the slack when the grain tank needs to be emptied. In addition to its 2.5m extension, this modified 4XL auger also gets a longer windsock to help grain find the trailer using the preferred CTF grid spacing. The extended auger carries its own orange flashing lights to warn other road users of its presence. Mr Smith says: “We sourced a 3m section of auger from a burnt-out combine and modified it so we could bolt 2.5m into the existing auger. Mr Smith says the bolt-on auger extension and its accessories can easily be removed and the combine swiftly converted back to ‘standard’ when the time comes to upgrade.